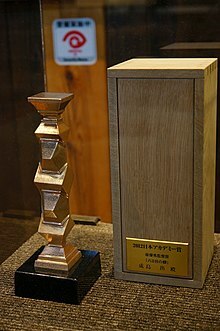 The Japan Academy Prize (日本アカデミー賞, Nippon Akademī-shō), often called the Japan Academy Awards or the Japanese Academy Awards, is a series of awards given annually since 1978 by the Nippon Academy-shō Association for excellence in Japanese film. Award categories are similar to the Academy Awards. Since 1998 the venue is regularly the Grand Prince Hotel New Takanawa of Prince Hotels in Takanawa, Minato-ku, Tokyo. Admission tickets for this award ceremony are also sold to regular customers. As of 2015, there is a charge of 40,000 yen which includes a French cuisine course dinner named after the award ceremony. Spectators are expected to attend in semi-formal attire. Elementary school students and younger are not permitted. The award statue itself measures 27 cm × 11 cm × 11 cm (10.7 in × 4.4 in × 4.4 in). ^ "第38回 日本アカデミー賞授賞式 (The 38th Japan Academy Prize Award ceremony)]". Archived from the original on 2014-09-28. Retrieved 2015-01-16. ^ 映画神像について (in Japanese). 日本アカデミー賞公式サイト. Archived from the original on 2006-12-09. Retrieved 2007-02-04.